Poetological analyses that delve into various deeper levels of the text draw their energy today from new sources, distinct from those known in even the recent past. The prevalent approach for quite some time – following the structural analysts’ exhaustive efforts to reveal all the rigidly demarcated levels of texts – has involved contrarian readings, inspired by post-structuralism and deconstructionism, that showed the unbounded and anarchic movement of freely drifting textual minutiae. The spread of micrological projects indicated, however, that a custom was somehow being revived in them that belonged to the older traditional of philological analyses, of asking questions, even if peculiar ones, proper to poetics. Taking a passionate interest in details, in the micro (today we might rather say the nano), made interpreters hostages of certain philological discoveries, often lacking ready-made theoretical generalizations; such analyses sometimes constituted rather eccentric (micro)case studies, but they also intensified the habit of inquisitively pursuing transitory textual arrangements and tempering them in an effort to give consideration to the literary work’s right to self-regulation. Today literary studies find themselves in a fairly similar situation, which for lack of a better comprehensive term we propose to call micropoetics. Descending into the linguistic particles of a poem, tracing the movement of how the smallest threads are interwoven, chasing after the arrangements of concepts or images outlined in this micro scale represents a new encounter each time with the enigma of a text’s agency. As in experiments in the natural sciences, at the nano level we observe hitherto unknown phenomena involving the self-organization of literary works, produce new knowledge about these processes, capable of freeing us from previously existing certainties regarding the orders and disorders of literature. Micropoetics thus becomes knowledge about organs that we didn’t know texts possessed, but also about how these tools create their own organon, i.e. a new sequence of categories, principles for reading, and cognitive methods. What is more, discoveries of this kind simultaneously give a glimpse into the dynamic process of organization, the internal links that join texts in certain self-regulating orders, to a large measure independent of their contexts. That is not the end of the matter, because this movement of organization helps us understand the discrete phenomenon of texts’ interconnections with a multiplicity of external phenomena, the text’s prototyping of new kinds of connections, their production, and the awakening of their activity. Through micropoetics we can understand how it is possible for a literary work to become a centre for the crystallization of new forms of organization, new organs whose functions are not purely literary. The uncontrollable, uncodifiable, unpredictable world of new knowledge about textual organization is therefore simultaneously a world of new connections between texts and the world, and between the modes for organising the world of texts and new approaches to this. 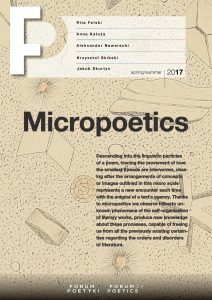 Micropoetics has become a point of departure for numerous scholars, and in this issue of Forum of Poetics we seek to showcase Rita Felski’s particularly noteworthy reorientation of philological studies. Through her gesture of breaking with ideologies of the literary work still in circulation, Felski reveals her ability to demonstrate the fundamental emancipatory potential of the work, inherent in its capacity to make an impact outside of any pre-existing code or project. The causative agency of texts has frequently been linked with their formal aspects, which direct the readers’ attention and regulate the force of receptive tension. As a result, an impression took shape, and took hold, becoming a practical certainty, that a text demands further illumination, analyses, exploration, and encounters, in order for us to have even an inkling of this unidentified microworld’s awesome causative power (and that the text itself exists, rather than dissolving in the interpretative context). Only this makes it possible for us to ask the kind of difficult questions that Felski raises in her essay (whose translation we herein publish) about the ability of certain works to exert compelling transtemporal effects. The articles in this issue of Forum of Poetics thus frequently address Felski’s book and other works of hers (Elżbieta Winiecka), but also engage in heated dialogue with it, mixing criticism and apologia (Marta Baron, Lucyna Marzec). In any case, we propose a broader spectrum of micropoetological reflection in order to show the multiplicity of the initiatives undertaken in this area. We begin with a reminder of the memorable accomplishments of the Silesian micrological school, together with a description by one of the participants (Aleksander Nawarecki). Readings in new Polish poetry lead Jakub Skurtys to add to the Silesian micrology project something which he calls micronautics, a theory (and practice) whose potential benefits result from a state of immersion in (and not merely analysis of) the particles of the poetic work. Micropoetics reveals itself to provide essential training in close scrutiny to scholars of the present time who study video games, as is shown here by Piotr Kubiński, and his important book in that area is discussed in detail by Barbara Kulesza-Gulczyńska. Next, Krzysztof Skibski discovers some exceptional phenomena in the poetic syntax in contemporary poetry, graspable by means of rigorous linguistic analyses. Anna Kałuża reminds us of the Debordian method of interception, and reveals its astonishing use in Polish women’s poetry of recent years. Łukasz Żurek’s attentive reading of Krystyna Miłobędzka’s poetry reveals the important light that a study of punctuation can shed on its meanings. Małgorzata Dorna argues forcefully that a micropoetological analysis can motivate us to return to the widely forgotten prose of Erskine Caldwell. Readers’ adventures and discoveries at various microlevels of a work are often guided by the elusive sense of the aptness of a particular fragment of the literary utterance, as Gerard Ronge attempts to elucidate. Finally, Helena Markowska recalls the studies of some later classicists and weighs the reasons why they took a fancy to the concept of what in Polish is called “rozbiór” (dissection or analysis). The topic of micropoetics drew strong reactions from the authors of the articles published here, probably unequalled in terms of their vivacity and scope by anything in our previous range of themes. Hence our confidence that, at the level of microreadings, contemporary poetics is in the midst of a thoroughgoing transformation.